Now that we’ve been at school for almost a month, you may be starting to feel a little tired because of all the work you have to do in order to be successful. You may even be starting to feel a little frustrated. Frustration comes when you have two conflicting goals. Maybe you want to earn high grades but you also want to avoid spending time doing school work after class. You know that it is unreasonable to expect high grades if you don’t earn them, but you still don’t want to do any homework. So you feel frustrated. Maybe you want to talk in class almost constantly because you like talking, but you also want to be known as a cooperative and respectful student. You know it is unreasonable to have a reputation as a trustworthy student if you don’t follow the teacher’s instructions, but you don’t want to be quiet. Not surprisingly, you feel frustrated. You are now old enough to understand that some goals aren’t easy to reach. You are also old enough to understand that being part of a group has disadvantages as well as advantages. So, you have to decide what is most important to you. Do you really want those high grades even if it means less time to spend on your other activities? Do you really want to be part of the class even if it means that sometimes things don’t go your way? As soon as you decide what is most important to you, your frustration will start to go away. You may feel disappointed or sad for a short time, but you will know what to do: go after the goal you’ve chosen. And if you take the time to feel grateful for all the good things you do have in this life, you will soon start to feel happier. Looking for a good book to start the new school year? Nothing But the Truth by Avi (Orchard Books, 1991) is an Newbery Honor Book about a ninth grader who likes to run. But when a failing grade takes him off the track team, he is sure his teacher is to blame. Parents, administrators, lawyers and the media all become involved. But who is telling the truth? For more books for young adults, click here. 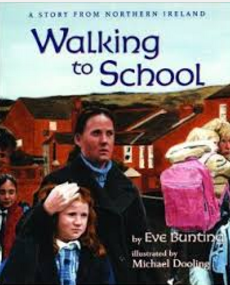 Walking to School by Eve Bunting (Clarion Books, 2008) describes eight-year-old Allison journey through a Protestant neighbourhood on her way to a Catholic school. Discussions about prejudice and courage could all follow from this picture book suitable for grades three and up. For more books about courage, click here. A Fine, Fine School by Sharon Creech (HarperCollins, 2001) tells the story of a principal who loves his school so much that he wants the children to attend classes every day of the year. His students have to show him that free time is a good thing, too! This picture book is not only lots of fun but can also be used for teaching parallel structure, conversation, plot and theme in writing. For more picture books useful for teaching writing, click here. Schooled by Gordon Korman (Scholastic Canada, 2007) is a humorous story told from various points of view. But they all focus on thirteen-year-old Cap who is entering middle school for the first time after spending years being home schooled. This book is on the ERAC recommended novel list for grades 6-8. For more books by Gordon Korman, click here. Hold On To Your Kids: Why Parents Need to Matter More Than Peers by Gordon Neufeld and Gabor Mate (Ballantine Books, 2006) is essential reading for parents and teachers. The authors explain why children turn away from their families and how they can recover a sense of belonging with the adults around them. For more books for parents and teachers, click here. Reluctantly Alice by Phyllis Reynold Naylor (Aladdin Mix, 1991) describes Alice’s triumphs and trials as she starts grade seven. To see a list of all the popular Alice books, click here. Thank You Mr. Falker by Patricia Polacco (Philomel Books, 1998) tells the story of Trisha who feels like an outsider because she can’t read until her fifth-grade teacher changes how she views herself. This picture book could help start an insightful discussion for grades 4-7. For tips on reading aloud, click here. My Name is Yoon by Helen Recorvits (Foster Books, 2003) describes the experiences of a Korean child who is struggling to learn a new language and adapt to a new country. This picture book would be a great read-aloud but could also be used for teaching elements of a short story (problem, strategies, resolution). For an outline on analysing a short story, click here. Nasreen’s Secret School: a True Story from Afghanistan by Jeannette Winter (Beach Lane Books, 2009) tells the story of a young grief-stricken girl who hasn’t spoken since her parents disappeared. Will school help her learn to speak again and find happiness? This picture book would be an excellent read aloud for students in grades 4 to 8. For more books about recent wars and conflicts, click here. Feather by Jacqueline Woodson (Puffin Books, 2007) is a Newbery Honor Book about a sixth-grade girl called Frannie who is reading a poem about hope in school. But there’s not much hope in her life. Her friend Samantha is becoming peculiar. The class bully is becoming more trouble. And the new boy, nicknamed ‘Jesus Boy’, says he’s not white but he sure looks like he’s white. What’s going to happen next? For more Newbery winners, click here.